The long runs – and short runs – provide plenty of time for thinking and as a particular race approaches, plenty of time for reflection. Saturday, according to the Pfitz 18/55 plan, called for a 10-k race. Since there were no events close by – not that the schedule would have allowed it mind you – a 10k time trial is recommended. The ideal setting is a flat venue, such as a track. So that was the setting for Saturday’s 10k trial and as I ran around the track at the qplex in Quispamsis, it got me thinking of those days in Grade 7 at the Victoria Park oval in Charlottetown. Unlike the modern facilities that exist today, such as the new track at UNBSJ or the one at UPEI that was used for the 2009 Canada Games, Victoria Park, the standard of the day, featured, if recollections are accurate, a gravel base track. It was the location when Queen Charlotte Junior High students ran their annual track and field day. I’ve never been much of a sprinter, so I recall signing up for a 3,000 metres and nearly dying with exhaustion, watching my peers race around the oval with ease. It was an introduction to the sport that eventually led to membership in a school running club, that I think built a positive foundation for the sport – albeit with a 20-year interval! In the day, Victoria Park was the go to place for provincial championships at the club and school level and the site for numerous recreational and competitive activities, including softball and baseball. So Saturday, the track at the qplex reminded of Victoria Park in some ways – with its gravel paths in the hub of our community’s recreational setting. With just two weeks remaining before the Prince Edward Island Marathon, the countdown is in high gear and the number of training runs is dwindling. In fact, in the Pfitz plan, there is a heavy emphasis on regular evaluation of progress. That started in Hampton on Sept. 8, continued in Fredericton with a half marathon and essentially ended Saturday with the time trial. The results, along with hitting regular training mileage, serve as predictors of the big race in two weeks time. In fact, there are a host of areas where you can plug in your times from these tests and get a predicted result. The results of those can be pretty flattering but are estimates based on a heavy volume of regular training in the 50-60 mile range and a number of marathon training cycles. So for relative marathon newbies, the predicted results are often overly optimistic – because the mileage is often lower than required. Another interesting predictor – which I have not tried – are Yasso’s 800s, a series of ten 800 metre repeats, with a break in between. In essence, two laps take me approx 3.5 to 4 minutes. The theory goes if you run 10 of these and average the times, you will have an accurate predictor. For example, if your average for the 800 minutes runs is 3:45, you should be able to run a 3:45 marathon. Another area for feedback and advice exists on forums at places such as Runner’s World, where you can provide experienced runners, coaches with assessments of your training log and these test results to get their thoughts on a potential goal time. You better be ready for the feedback as it is not sugar-coated. Ultimately, that is good. For example, I gave my info, told of my lag in August in addition to my test times. Their assessment was consistent – breaking four hours is possible, but not by much. And I can blow it in the first 20 miles by going too fast – even by 10 seconds a kilometre. Do that and I’ll be toast. They figure while 3:59 is possible, 3:50 is definitely not. And there was concern in the drop off of pace from my 5 miler (approx. 4:37/km) to the half marathon (approx. 5:00 per km). This contrasts my predicted times – in the 3:40-3:45 range – for the McMillan Race calculator. Given how I feel, the forum experts seem to be bang on, I figure. So back to Saturday and the time trial at the qplex. My goal was to try for a new PR in both the 5 k and the 10k. To accomplish this, I wanted to run at a pace at 4:42 per km or better for the 5 km and 4:47 or better for the 10 k.
The temperatures were right – cool, crisp – and while there was a wind, it was at my back on the front stretch and facing me on the front stretch, essentially evening out. After a 4:24 first km, I worried about burnout and as it went on, I did tire each km. But the results were positive and encouraging. That took about one full minute of my previous best 5 km time (in training) and 2:41 off my previous best 10 k time (in a race in P.E.I. last year). I am not sure I want to trust the results but it was a great run. Sunday, capped the week with 27 km run, easy pace in 6C weather. It was a nice run, no problems, very encouraging. This week, the taper continues, with a decline in the length of runs. One this week has a 13 km easy effort with 3×1,500 metres at 5 km pace. Long run of 19 km on Sunday, the lone distance above 13 km in the upcoming two weeks. There are fewer than 10 runs remaining before the big one. Finally, the marathon season is well underway and Sunday, the Maine Marathon in Portland kicked it off. There is the final running of the Kennebecasis Challenge this weekend in Rothesay as well as the Valley Harvest in Wolfville, then PEI and finally the Legs for Literacy in Moncton the final weekend of the month. Let’s hope the weather holds up. 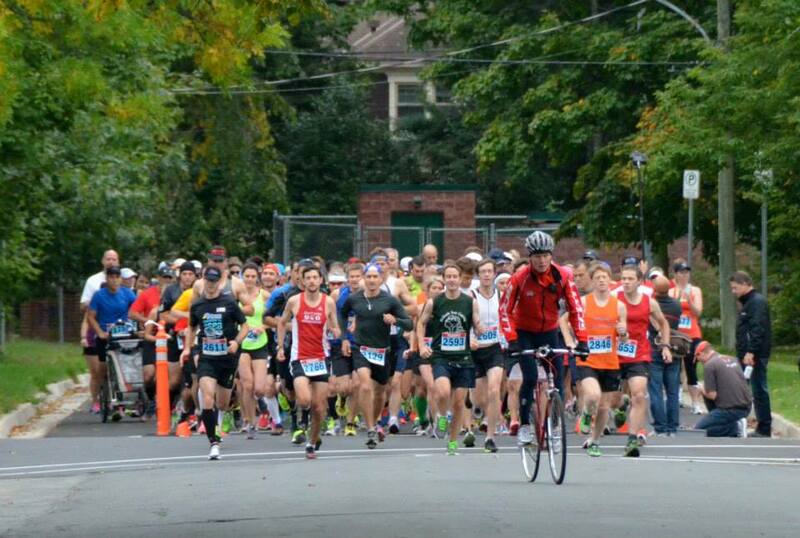 There were about 200 racers in the half marathon segment of the 31st Fredericton Fall Classic last weekend. Sunday was my second and final race test before the P.E.I. Marathon as I signed up for the half marathon at the 31st edition of the Fredericton Fall Classic. The goal was to not hold back in order to gather current fitness information, so a more accurate goal for the P.E.I. Marathon could be established. It was the same course I ran back in May, 2012 with a good time, so I was excited. My wife also entered, running her first-ever 10 km race. Great stuff. Prior to the festivities, we left the girls with our good friends in Rothesay and headed to Fredericton Saturday evening, where we met some friends for dinner, enjoyed the evening and had an early night. Trouble was, as it always is, it was a little tough to get to sleep the night before a race because of anticipation, etc. We woke up at 5:55 a.m., headed to Tims for a light breakfast and then to the start area. The half was slated to get going at 8 a.m. and when we arrived, there was a lot of activity. After a warm-up, I headed to the line and saw a few familiar faces. In addition, there seemed to be a large collection of extremely fit runners and judging by the finish times (10 per cent of the field beat 1:30 and 20 per cent were better than 1:40 see note below), there were plenty of fast, fast athletes in the field. This was my first race with the Nike + app and I was interested in how it would work. As it turned out, its GPS capabilities were not 100 per cent accurate, off by about 8 seconds per km I figure – and that meant it registered the half marathon at about 21.61 km. Here are the splits it recorded, which I estimate as 8 seconds faster than actual. First third – 4:39; 4:51; 4:45; 4:47; 4:55; 4:53; 4:47. I went out with the rabbits and it was a little too fast as evidenced by the early clocking. The fastest I had gone in tempo runs was 10 km at 5:00, so this was a test, big time. Things settled in after about 4 km but I was sliding back, getting passed by more than a few souls, particularly around the 6 km mark. I felt slightly winded but was in control and told myself to hold back, knowing it would be a challenge to stretch this pace the whole way. That was in part to the 88 per cent humidity reading and 19C temperature reading at the start. As I have noted before, humidity is a killer and I did not want to slide later in the race. Middle third – 4:53; 4:44; 5:02; 4:57; 4:51; 4:53: 4:54. This was all trail running, with some windy sections but, with the exception of enthusiastic volunteers at water stations, it was very quiet. We crossed a bridge as we approached halfway, and generally, I was starting to feel more comfortable, albeit hesitant to move ahead and catch some of those who had passed me earlier. But by the halfway point, I started to slow down (5:02) and then, as more and more runners were coming back toward me after the turnaround point, I opted to pick it up slightly and pass a few people. The trail is tight at the 11 km mark for the turnaround (it is further out because, on the return leg, we did not have run the initial 800 yards or so that we did in the first lap). There was a water station, a porta-potty and several people stopped for drink or relief. That opened space and gave me a sight line for about 10 people I was closing on. That became an in-race goal – to track them down. 4:51; 4:54; 4:47; 4:57; 4:44; 4:53; 4:52 (I do not have a reading for the final 600 metres). The beauty of this race is the flat course, which really saves you some energy in the final stages. So over the course of kms 14-18, I managed to pass about 10 people, including one man who I went back and forth with a couple of times. It felt good to have something in reserve, while still hitting the goal of running about 5:00 per km. With 4.5 km left, we started to meet those in the 10k race, which started 45 minutes after the half got underway. My wife and I predicted we would see one another at this segment and we were right – with about 3 km left. I tried to encourage her when we met, saying there was just a bit left. Seeing a familiar face boosted both of our spirits for the final stretch. In contrast to other races, where the athletes can be stretched out at the finish, the congestion of the 10km runners proved motivating as well. 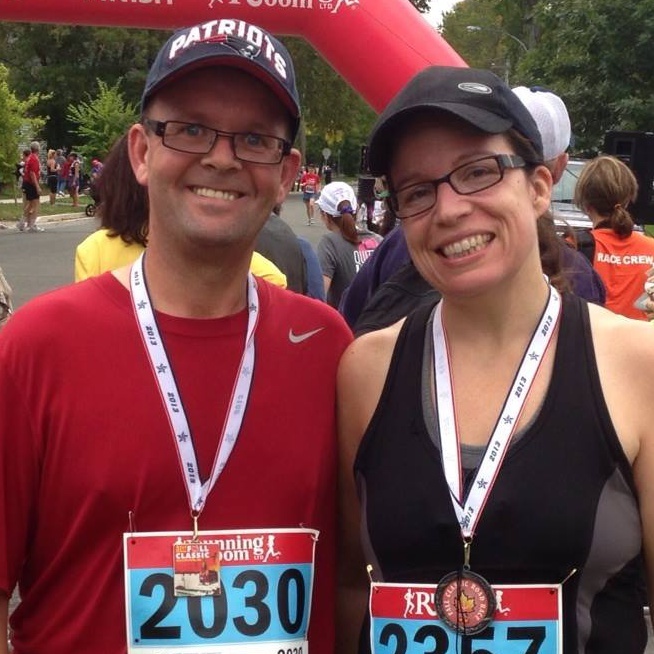 We celebrated a couple of nice runs after completing the Fredericton Fall Classic! Early on, I realized I’d have to go further than the Nike app indicated and when I approached the finish, I saw 1:45 on the clock and was content, figuring I had a bit left but satisfied I could stretch that 5:00 per km pace the entire distance. That is especially so in light of very little taper and an 18 km effort three days previously. After, I walked back and met Kathy, encouraging her as she completed her first 10 km race. She met her goal time and is setting up for her first half in PEI as well!!!!! A) It is good to be completely prepared when you leave the house and that includes taking along everything you are going to wear. For me, I thought I was ready but in the rush to leave Saturday evening for Fredericton, I forgot running socks. We enjoyed a great evening and dinner in the Capital City Saturday, where I wore dress socks. They doubled as race socks on Sunday. No problems, other than the obvious fashion faux-pas. B) I thought there were a lot of speedy runners in Fredericton and judging by other results, that theory was correct. In this weekend’s event, 10.7 per cent of the field beat 1:30 and 21.9 per cent of the runners were better than 1:40. At the Saint John Marathon By the Sea, six of 358 (1.7 per cent) half marathoners beat 1:30 and 28 of 358 (7.8 per cent) were faster than 1:40 while in the Fredericton earlier this year, 21 of 564 half marathoners (3.7 per cent) were better than 1:30 and 54 of 564 (9.6 per cent) were faster than 1:40. In Moncton last year, 10 of 691 half marathoners (1.4 per cent) beat 1:30 and 49 of 691 (7.1 per cent) were faster than 1:40. So overall, the Fall Classic was fast – very fast. This is the final week before taper, which means two medium long runs, one with some speed elements. In addition, the weekend features the last and longest run before P.E.I. – a 32 km effort. I’ll see how the weather is before I decide whether to run a portion of this at marathon pace or just opt for the long slow pace. Next week, the plan calls for a 25 per cent reduction in training, although there are still some decent runs there. The following week is a 50 per cent dip in distances and the week after that sees 4-5 minor runs to keep active and deal with pre-marathon jitters.